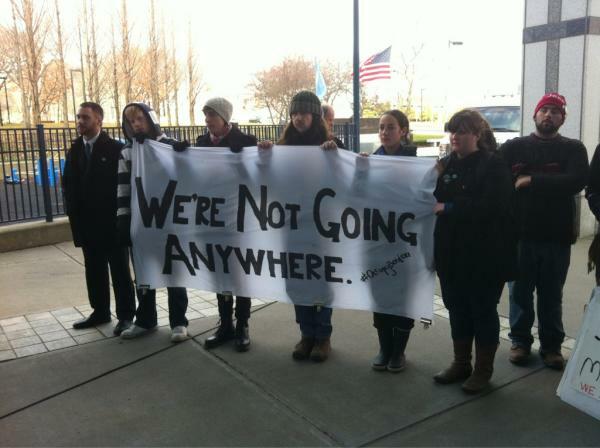 Occupy Boston: "We might have been evicted, but we shall not be moved." Occupy Boston will hold a post-eviction General Assembly tonight at 7 pm at the Band Stand on Boston Common. Supporters are currently holding a silent protest in front of the Boston Police Department while waiting for arrestees to be released. Follow on Twitter: @Occupy_Boston or please join them if you are in Boston! They came by bus from New York and DC. They carpooled from Providence and flew in from Chicago. They drove from Worcester, New Hampshire, Vermont and Maine. Last night, demonstrating how clearly Occupy Boston’s message has been heard and understood, two thousand people traveled from near and far to defend Dewey Square. They painted signs and spoke in General Assembly. They chanted and sang, “Which Side Are You On?” six times, at least, as a brass brand blew steam into the frozen December night. They rallied at midnight, making circles two deep around tents, as the Veterans for Peace stood guard, white flags snapping in the wind. They dressed as bankers so that bankers might be arrested for once. And when the news came that no raid was coming, no eviction imminent, they danced in the streets to celebrate.